This was a bear of an album to review. Let me elaborate a bit for clarification… it’s not just because Italy’s Mourning Mist are a new band with precious little background besides having bassist/vocalist Kvasir (also of Profezia and Abhor) in their ranks, as well as a violinist. Hell, violins in metal ain’t nothing new, right? Just describe their tunes utilizing Grymm’s Genre Classification System (TM, Patent Pending), throw some impressive adjectives in there while avoiding the use of the words “swagger” and “samey” without once mentioning My Dying Bride, throw a numerical score, add a video… and BOOM! Done! Only if it were that simple, folks. Their self-titled debut is a little headier, and much more deserving of a fleshed-out description, but how do I best describe it? For starters, yes, violins have been in metal for quite some time now. The way that violinist/vocalist Ecnerual plays the violin, however, is quite unique. Rather than being up-front and noticeable like My Dying Bride, his playing lurks in the shadows, oftentimes blending in with the guitars rather than screaming out for attention. Opener “The Flowing” is a good example, with the violins acting as feedback, creating drama as the drums thunder slowly forward. 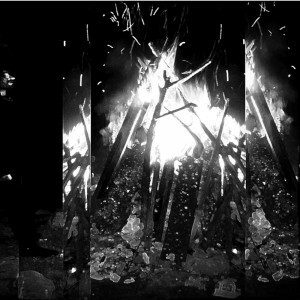 The feedback becomes an uneasy, eerie ghost-like apparition before making you realize that yes, this is a violin in a blackened avant garde band, but even then it’s impressive, as they help create different moods within just this one song. “The Flowing” starts off horrific, then twists into mournful doom, before fading to black (metal) with a nice connecting flow throughout. Each of the six songs on here are a bizarre journey through familiar, yet strange, territories. “Rage” begins with a Sabbath-like riff before going all Kansas on us (think “Point of Know Return”) in parts, with drummer/vocalist Mid’s fills keeping things from going way out of control. Somber violins, frantic riffing from guitarist/vocalist Chris, and Kirsten Dunst (via a sample from Lars von Trier’s 2011 epic depress-athon Melancholia) lead-off album highlight “Torment,” showering the listener in some truly disgusting, uneasy blackened flourishes that would make both Blut Aus Nord and Deathspell Omega take notes. Even closing instrumental “Lament” paints a somber, delicate epitaph to such a chaotic, harrowing trek. Sonically, the album is quite warm and clear, despite the lack of dynamics. The drums sound organic, the guitars and violins are vibrant, and the bass pops when necessary. Did you notice that I have not once mentioned the vocals on this album so far? For as much as I enjoy this album, the shouting barks on here are a huge distraction, sounding like a cross between Justin Broadrick (Godflesh) and Tom G. Warrior (ex-Celtic Frost/Triptykon), but somehow very goofy when painted over such an impressive canvas. It’s not quite clear exactly who is performing the vocals, as the vocal duties are shared between all four members and not one is listed as a lead, but it needed to be mentioned, as it was a major sticking point to an otherwise impressive debut. It isn’t often that I have such a hard time describing what I listened to and conveying it properly to you, the reading folk. 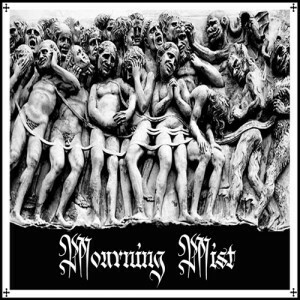 Mourning Mist actually did what many others proclaim they do: taking their influences and blazing new paths with them. The vocals need some work, but this is a great start for a promising new band, and one hell of a debut.